Pours a dark brown, almost totally opaque with just a hint of light showing in the bottom of the glass. This beer has a very rich tan head, very creamy for a double bock with some soapy bubbles mixed in. Wonderful rich roasted caramel malt aromas on the nose. The aroma is almost stout like. There is also just a faint hop presence. Oh My! That is one smooth malty brew. I don’t think I’ve ever used the word luscious before in describing a beer but that’s the word that pops into my head. This is so rich and creamy it’s hard to describe any other way but that it’s luscious. It is just a sweet rich malty, luscious beer. There are not a lot of different sensory feelings going on in the sip, it’s just one continuously building taste of the most delicious malt sweetness growing to a climactic finish when your whole mouth is just coated in the most luscious smooth and creamy malt goodness. Smooth Rich Sweet Creamy Goodness, that’s what this beer is. I’ve been referring to it as sweet but it’s not a candy sweet it’s a nice dark caramel malt or dark chocolate type of sweet. As this beer warms up it just gets better if that’s possible. Even the nose is now enhanced with more aromas. There is an almost smoky aroma along with those rich caramel malt aromas and a gentle swirled of the glass brings back a light hop presence. This beer is smoother and creamier than many cream or milk stouts. So many times the malts in a stout or double bock become bitter from the roasting, an almost burnt taste. This brew seems to take these malt’s just to the limit of roasting without making them bitter. We are now at 68 degrees on the beer. I can’t describe how good this beer still is. It has lost nothing, in fact it has gained more pleasant characteristics after warming up. Most of the carbonation has left the beer at this point so you have a richer and creamier mouthfeel, without it being syrupy. Wow this is so good I hate to see it end. I’m savoring every drop of this one. Wow, to have a beer taste that good at that temperature, well, it just doesn’t happen everyday and it doesn’t happen by accident. I had a similar experience with the Ayinger Oktoberfest, that was also good to the last warm drop. Hats off the Ayinger for another Phenomenal brew. I have had this beer at different beer tastings and liked it but I never realized until now just how good it really is. There is a big difference in having a few ounces at a tasting and experiencing the character development when having a full glass. Especially when allowing the beer open up and warm up you fully get to appreciate the whole experience, craft and artistry of a good beer. Well good doesn’t cut it, this is Phenomenal, no don’t about it; this is the best double bock beer I’ve ever had. This is one of the few beers that an A+ just doesn’t seem sufficient enough for a letter grade. I may have to revise this to an O for Outstanding! 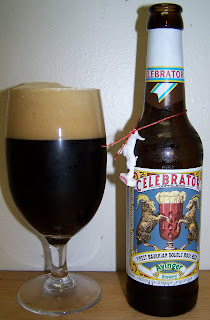 And it comes with a little Celebrator Goat or Ram tied on a string around the bottle and a pretty cool label. I really enjoyed my two bottles...unfortunately for me, Josh got my other two! We are heading back into Rockford this weekend with a planned stop at Woodmans and another store that purports to have a good stock of beers. Apparently they sell a lot of mixed 6-packs too! Man what you have to go through to get good beer. I made chili this weekend with a German smoke beer and served it with this beer. It turned out to be a nice pairing. So did the little princes get the ram from the bottle? Or are you going to put it on the Christmas tree? I'm not sure where the rams ended. That was a really good beer, though! Gee Missy, I thought that you would have saved one for your Christmas tree. LOL. I’m saving one me my tree this year.